Budget holidays are the only way to travel. No matter how much money you have, no one wants to spend more funds than necessary to have fun. This is what makes Phi Phi Island holidays so impressive. You can enjoy some of Thailand's best scenery on a Phi Phi Island holiday while spending little cash. There are many places to ways to reduce the money on your Phi Phi Island holidays. The cost of the hotel or resort usually eat up most of the money on budget holidays so this seems the right place to start. Also there are many establishments on Phi Phi island that offer discounted pricing. These categories show the breadth and depth of what is available on the Phi Phi Island and get you in the mood and grove of the way Phi Ph Island is. You will see that most 2 star bungalow resorts at the economy end and all the resorts at the top end of the spectrum are on the beach, a sensational advantage for most people doing island holidays. Guesthouses in the village and Phi Phi Hotel, Phi Phi Palm Resort do not have beach frontage but you are never really more than 200m from the sea. Another key research tool is the Free Night Specials tool that takes you directly to what is available right now and gives you the cheapest Phi Phi Hotel and Resort prices on the net. Finally the company's 10 year deal will give you 1 night free if you book 10 nights or more. This is a deal for all Phi Phi island Hotels and all HotelATM.com hotels throughout Thailand and further a field. This deal means that if there isn't a Special deal from the hotel, phi-phi.com will give it's long staying customers one anyway. Phi-Phi.com calculates your saving automatically so just put in a stay longer than 9 nights and you will get your saving. 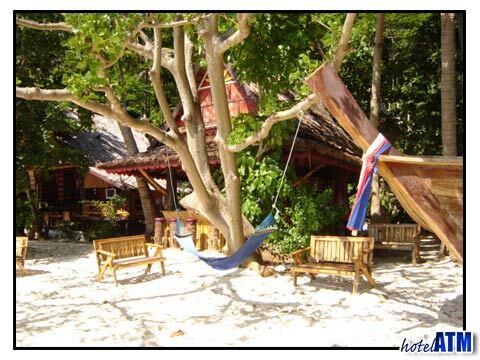 Personal reviews; Phi Phi Island Village Resort And Spa is one great place to stay on Phi Phi Island. Given the popularity of this Phi Phi island Village Resort and Spa, you do not have to spend outrageous prices and bust your budget. Here, you are truly isolated from the hustle and bustle of society. The resort has wonderful facilities, is extremely tranquil and right by the water. Another hotel to spend budget holidays on Phi Phi Island is the Phi Phi Viewpoint Resort. This is another resort that also comes with a small price tag. It is located near the quiet part of the village right on the eastern edge of Loh Dalum to allow tourists a relaxing Phi Phi Island holiday. It is here that you can view breathtaking sites of the cliffs on Phi Phi Don. PP Casita is very popular in the village as the rooms are well priced and often compare with guesthouse prices especially in high season. This simple (Bungalow Air Con) to comfortable (Building Air Con) mini resort has a lovely pool and breakfast zone next to the swim area. One of the most well known budget holiday hotels is the Holiday Inn Phi Phi Island. Again the budget in mind will be impressed with their price tag. This is the most popular hotel with repeat customers in the area and a startlingly high occupancy rate. The famous name and well known brand make it a local and international favorite. Guesthouses on Ko Phi Phi. The guest house scene on Phi Phi is still very vibrant in the main village and you can pick up a great deal most of the year. In the high season and peaks it is very difficult to get the perfect room as prices rise as the island stays full. In peak season it is best to get the morning boats to Phi Phi island to avoid disappointment. See here for the directory of Phi Phi island guesthouses. On any get-a-way, food can add a lot of money to the final bill. However, Phi Phi Island holidays allow tourists the option of fine dining at expensive costs, or delicious inexpensive dining at affordable costs. Although many of the resorts include superb restaurants, not all of them fit into a budget holiday. One dining experience you must take advantage of is the seafood and superb seafood platters are available at a fifth the price of Europe. Eating in style and on a budget is easy on Phi Phi Island if you know where to dine. Captain Pongs down near the pear is one of the local favorites for authentic Thai food. They specialize in their fried noodles and friend rice. The Thai Bird Seafood opposite Moskito diving is another restaurant that fits into a budget holiday. It provides inexpensive and simple dining. If you are a little more daring on your Phi Phi island holiday, head over to local market. This is authentic, Thai food enjoyed by the locals. Sometimes and in the south of Thailand that means often! it can be spicy as hell, so make sure you have the right stomach for the job. Phi Phi Island holidays don't need to break the bank. If you do a little research, you can experience a Phi Phi Island holiday in style while spending little cash.